Thank you for the clear info on the fire and the impact on hiking in the area for 2016. Any insights into hiking from Road’s End on the SEKI loop (which includes a stretch of the JMT?) 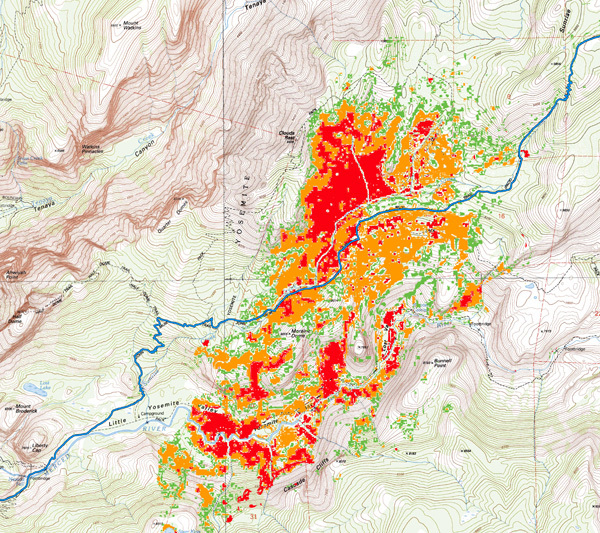 where the Rough Fire burned for some time in 2015? The Rough Fire was huge, Martha, but I don’t believe it ever reached the JMT. A quick call to the Wilderness Center in SEKI should provide the latest information, although they may not have a complete picture until spring. Thanks for the comment! Hi Ray, I hiked through the area August 15th last year, starting in the valley and spending the first night at Cloud’s Rest Junction. I don’t remember it being a total burnout, exposed in some areas. Despite reports of no water, there was water at the Junction and I stopped and soaked my feet in Sunrise Creek before the switch backs going up to Sunrise. It was a challenging hike for a 68 year old, yet there is so much to see and enjoy on the trail. Thanks for your wonderful Blog. Doesn’t sound too bad, Jerry. Thanks for the info! I went over clouds rest last year and avoided the burn area entirely. This route involves a big climb and would be difficult at the start of the hike with a heavy pack, but is well worth the effort. I was completing my NOBO through hike, so altitude and trail fitness where not an issue. Thanks, Tom. That’s a terrific alternative.